The minister is now insisting her PC government did not break a promise. Lisa Macleod, Ontario's Children, Community and Social Services Minister, talks with the media after Question Period at the Ontario Legislature in Toronto on Thursday. 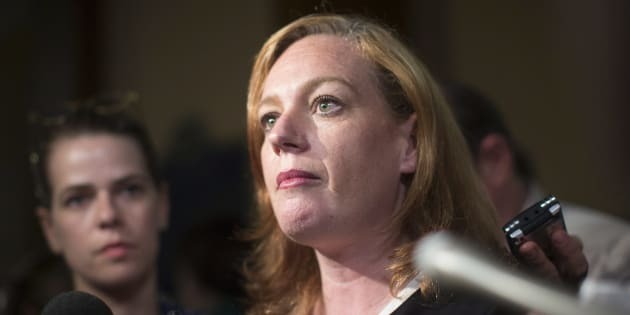 Ontario minister Lisa MacLeod called reports that she admitted to breaking a campaign promise "fake news" on Thursday. One day before, MacLeod said the decision to continue Ontario's basic income pilot project changed after the election because of the "realities of when you're in government." That was reported as an admission of breaking the PC's campaign promise not to cancel the pilot. "We did not break a promise. That fake news that was in the news today totally mischaracterizes what we are doing," the minister for children, community and social services said during question period at Queen's Park on Thursday. "We said we are going to wind down the basic income research project ... We have made a commitment that we will have a long, lengthy, compassionate runway in order to transition people." The term "fake news" was made common by U.S. President Donald Trump, who uses it to discredit negative news reports about him and his administration. MacLeod announced that the basic income pilot would be shut down about two years early at a press conference on Tuesday. Participants had not been notified and still haven't received any information about when their payments will end, four people enrolled in the program tell HuffPost Canada. MacLeod also said Thursday that the program would have cost $17 billion and caused a six per cent increase in the HST. That is not the cost of the three-year pilot, but the cost of a province-wide basic income program, a spokeswoman for the minister's office told HuffPost Canada in an email. The pilot project was budgeted to cost $150 million over three years. This story has been updated with comment from the Ontario Ministry of Children, Community and Social Services.